For the grand sum of $10, I recently purchased a eMachine EL1300G small footprint bare-bones computer at an Asheville Goodwill store. The computer contained the motherboard, 1.6GHz AMD Athlon 64 2650e processor e/w heatsink/fan and power-supply, but was missing the RAM, hard-drive and CD-drive, which is true for all of Goodwill’s $10 bare-bone computers. Goodwill’s used RAM sticks were more expensive than what I could get on eBay, so I purchased 2GB of used but guaranteed good Hynix PC2-6400 DDR2-800MHz DIMM Desktop Memory RAM non-ECC 240pin on eBay for $15.50 (including shipping). I grabbed a 250GB SATA hard-drive from my spares box and the eMachine computer booted cleanly into the Linux Mint-12 installation that was previously loaded on the drive. While I put nice SATA DVD-RW drive into the machine, I didn’t want to leave it there – I wanted to put in an old IDE DVD-RW drive that I have in the closet. However – this eMachine supports only SATA drives. There is no IDE data connector and no MOLEX power connectors – only SATA! 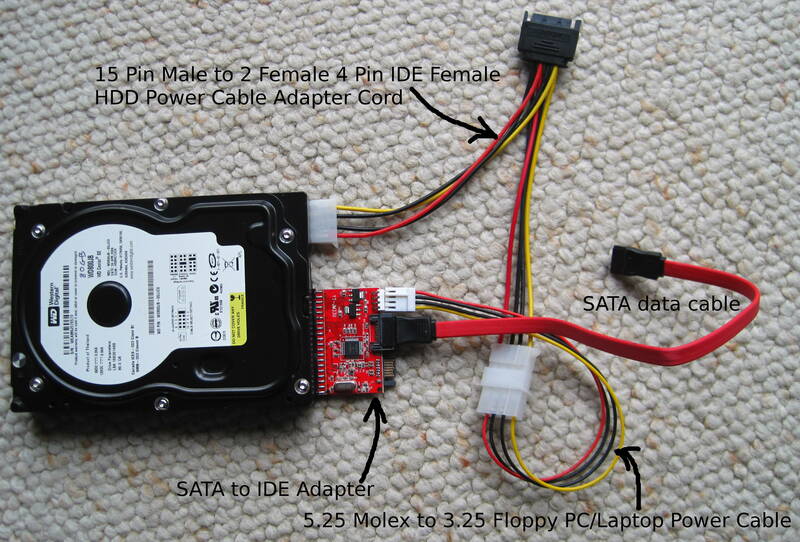 After some research, I went looking for an inexpensive IDE-to-SATA adapter solution. I purchased what I needed on eBay. Here is what I purchased. Once all of the parts were received, I tested with an old IDE drive and this parts combination worked flawlessly! The image below show how the parts are connected. The eMachine EL1300G is no speed daemon but adequate as a web browsing machine, and my total cash outlay is $30.76. This entry was posted in computer, Electronics, hardware and tagged disk, IDE. Bookmark the permalink.